It was a dreamy day for the second-string West Indies team. Make no mistake, they are still just a makeshift attack but Bangladesh played poor cricket to be bowled out for 238. It could have been worse, as they were struggling at 172 for 8, but Mashrafe Mortaza and Shahadat Hossain swung their bat bravely post-tea - after rain robbed much of the second session's play - to push Bangladesh towards respectability. They then dealt West Indies an early blow, Shakib Al Hasan trapping Dale Richards, who celebrated his Test debut with a stunning pulled six to get off the mark, plumb in front to ensure Bangladesh ended the day on a high. In that phase of relative recovery led by Mortaza and Shahadat and later during Shakib's two-over spell, there was turn and bounce on offer to the spinners which would have interested Bangladesh immensely. It would have offered them hope that they could still come back in the game after the meek capitulation by their top-order batsmen against a spirited West Indies team. West Indies fans wouldn't have expected magic balls from a weakened attack and there weren't any today. However, what they would have hoped for is discipline, commitment, and hunger from the group of men who had been given this unexpected honour to play Test cricket. And they didn't disappoint today. It was a professional, disciplined performance from the bowlers who repeatedly kept hitting the right line and length on a slow wicket. Nearly everyone produced their top game. Take Tino Best for example. He has, in the past, been guilty of trying to bowl faster than what he was capable of and being erratic as a result. Today, he repeatedly hit the short-of-length in the off-stump channel and slipped in the occasional bouncer. He struck the early blow, luring Tamim Iqbal into a fatal drive with a full delivery outside off in his first over of the day. He returned later to repeat the delivery against Mohammad Ashraful, who also edged it behind. 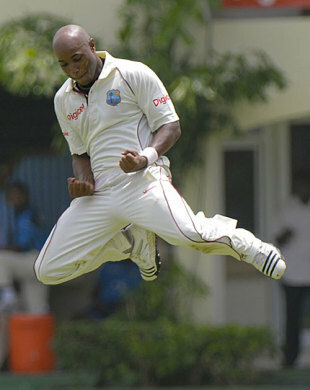 His celebrations after taking a wicket - the wild run and pumping of the fist - remained as colourful as ever. While Best is a known name in international circuit, what would have really warmed the hearts of Caribbean fans is the emergence of the 21-year old fast bowler Kemar Roach. There was enough on show today to make one believe that Roach won't need a strike by the main players to play for West Indies in the near future. It was said that early in his career he used to chiefly dart his deliveries into the right-handers but in the recent past, he has worked hard to get the one that straightens and even curve away. There were two Roach moments that stood out today. The first was a lovely rueful smile as he stood in the middle of the pitch after beating the bat for the nth time without any luck. The second, an act of pride, arrived when lady luck eventually smiled on him; he kissed the Caribbean emblem on his shirt after taking every wicket. His day's work had started with a series of heartbreaks as he repeatedly harassed Raqibul Hasan outside the off stump without any luck. Time and again, Raqibul drove and jabbed his bat inside the line of the deliveries that straightened outside the off stump. Roach got the edge on one occasion but the ball flew straight between first and second slip. Ironically, Roach himself gave a reprieve to Raqibul when he dropped a sitter at backward square leg off the bowling of Darren Sammy. Roach was impressive against the right-hand batsmen but, against the left-handers, he kept pushing the deliveries a touch wide across the body. In the second session, he returned to trouble Mahmudullah with a mixture of outswingers and yorkers before inducing an edge to backward point. And in the final session, he took out Mashrafe Mortaza with a lovely leg cutter. Like Roach and Best, every bowler did his job. Sammy is your essential bits-and-pieces player who looks unthreatening with ball or bat in hand. But no can accuse him of over-extending himself and being unaware of his limitations. Today, again, he kept it simple, honing in and around the off stump with gentle medium pace. He was a touch lucky to get the wicket of Imrul Kayes, who looked the best of Bangladesh top-order batsmen. Kayes shouldered arms to a length delivery that straightened a touch on the off stump line and was struck on the pad. He was given out lbw though the ball appeared to be missing off. Dave Bernard's art is very similar to that of Sammy: steady supply of well-directed medium pace bowling. After ending Raqibul's misery with a full delivery that was squeezed straight to gully, he troubled the left-handed Junaid Siddique with his length deliveries that angled away outside off stump. In between, he hurled a short-pitched delivery that was swatted so weakly to cover that he was encouraged to try another one. That did the trick as Siddique pulled weakly straight to short midwicket. The bowling, though disciplined, didn't deserve six wickets in the morning's play but the Bangladesh batsmen seemed to be in a zombie mode, self-destructing systematically and regularly. Only two batsmen, Kayes and Shakib Al Hasan, showed the right approach and the skill but, unfortunately for Bangladesh, both fell to wrong umpiring decisions. Shakib, who looked assured in his brief stay, tried to sway away from a short delivery from Roach and the ball bounded off his forearm straight to gully. However, the rest of the main batsmen weren't up to the mark and would have only added more fuel to the critics of Bangladesh. Luckily for them, Mortaza and Shahadat, the bowlers, saved them from total embarrassment.